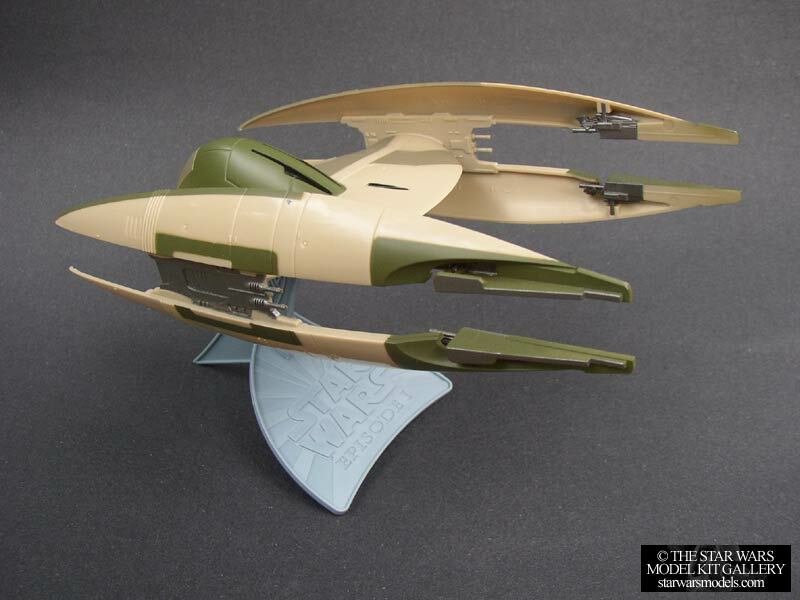 Estes Model Rockets made a number of rocket kits for Star Wars over the years, and one just happened to be a Vulture Class Droid Starfighter. Actually two are... One is in a blister-type hanging package, and it's dinky, so avoid it. The other, however, is boxed, and cost about $25 originally at Wal-Mart or hobby stores... And it's just about damn near 100% to-scale. A hair over, actually (1:16), but really the fudge room there is minimal... Another half inch the other way and it's almost exactly 1:18 rounded up... So what's this mean? The problem; they don't seem too common. I've known about the size/droid possibilities for a while, better than 2 years I think, actually. Unfortunately I haven't been able to find one to verify it compared to figures, until recently. Like I said, they don't seem to come around on Ebay often... I got one the other day for a fair price though. It's a sharp piece too, very detailed actually, and so it'll look good with the figures. Anyway... Tired of your Droid Fighters being inky dinky and weak? Hell yeah you are... Go out and improve your Droid army's scale. The tinnies will thank you for it. This is amazing work and craftsmanship. I think I bought one of these back in the day. True enough, they are hard to come by now. I actually pulled my photo from the guy that rebuilt his into a walking mode Vulture Droid Fighter... A very cool upgrade from scratch.